DJs make remixes while Spencer Ludwig makes trumpet edits and we are proud to exclusively premier them here on KickKickSnare. 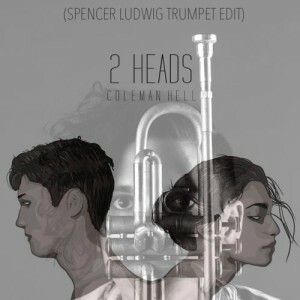 Spencer effortlessly takes on Toronto-based producer and vocalist Coleman Hell, who unleashed a hit in Februrary with “2 Heads” which reached #1 on the Hype Machine charts in just two days. With such a contrast to last month’s beautiful take on Vallis Alp’s “Young”, Spencer brings the party this time, taking over the main line of 2 Heads, adding a huge layered trumpet sound. His horn parts guide us through the emotions of the song and elevate the energy of the lyrics between the smooth and soulful solos and the funky danceable horn sections. The idea is fresh and innovative and we love it. Spencer reached out to Coleman Hell regarding this release. Not only did Coleman love it, but he asked Spencer if he would like to collaborate on his next single. We can’t wait to watch close for that release! Until then, check back next month for the third installment of Spencer Ludwig’s Trumpet Edits.